Bridal party attire helps to set the overall tone for your big day, whether it's glam, retro-inspired, or simply elegant. This season, there's so many chic options to choose from that we've compiled a guide to the hottest trends. From rose gold hues to high-low hemlines to strappy necklines and backs, your girls are guaranteed to find something that they love. Browse 70+ bridesmaid dresses (and even jumpsuits!) that will turn heads. Bridesmaid dress by Amsale (Style Sheridan). Bridesmaid dress by Watters (Style 2306). Bridesmaid dress by Sorella Vita (Style 8833). Bridesmaid dress by Bari Jay (Style 1705). Bridesmaid dress by Alfred Sung (Style D734). 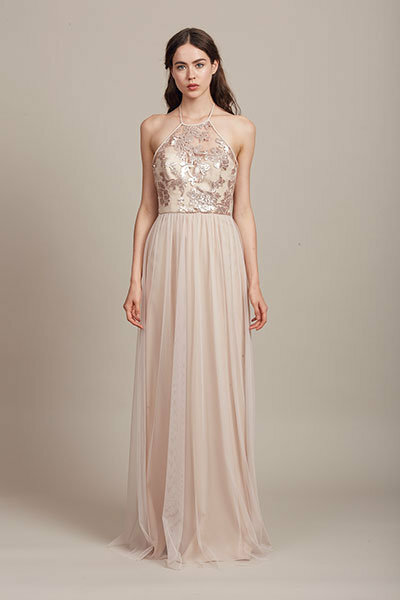 Bridesmaid dress by BHLDN (Style Sequined Alana). Bridesmaid dress by Lela Rose (Style LR241). Bridesmaid dress by Bill Levkoff (Style 1253). Bridesmaid dress by Wtoo (Style 340). Bridesmaid dress by Allure Bridals (Style 1509). Bridesmaid dress by Oleg Cassini for David's Bridal ( Style OC291280). Bridesmaid dress by Bill Levkoff (Style 1262). Bridesmaid dress by Allure Bridals (Style 1507). Bridesmaid dress by Mary's Bridal Modern Maids (Style M1815-1). Bridesmaid dress by Bari Jay (Style 1728). Bridesmaid dress by Mary's Bridal Modern Maids (Style S16 M1812). Bridesmaid dress by Bari Jay (Style 1729). Bridesmaid dress by Hayley Paige Occasions (Style 5668). Bridesmaid dress by Bill Levkoff (Style 1252). Bridesmaid dress by Allure Bridals (Style 1504). Bridesmaid dress by Joanna August (Style Kathy). Bridesmaid dress by Hayley Paige Occasions (Style 5663). Bridesmaid dress by Joanna August (Style Nikki). Bridesmaid dress by Oleg Cassini for David's Bridal ( Style OC291355). Bridesmaid dress by Joanna August (Style Gina). Bridesmaid dress by Studio Design Collection (Style 4513). Bridesmaid dress by Social Bridesmaids (Style 8182). Bridesmaid dress by Hayley Paige Special Occasions (Style 5623). Bridesmaid dress by Bari Jay (Style 1724). Bridesmaid dress by After Six (Style 6758). Bridesmaid dress by Hayley Paige Special Occasions (Style 5651). Bridesmaid dress by Bari Jay (Style 1732). Bridesmaid dress by THEIA (Style 910132). Bridesmaid dress by Dessy Collection (Style 2995). Bridesmaid dress by BHLDN (Style Zaria). Bridesmaid dress by Bari Jay (Style 1735). Bridesmaid dress by After Six (Style 6759). Bridesmaid dress by Studio Design Collection (Style 4518). Bridesmaid dress by Studio Design Collection (Style 4517). Bridesmaid dress by Dessy Collection (Style 2990). Bridesmaid dress by JY Jenny Yoo (Style JY533P). Bridesmaid dress by THEIA (Style 910117). Bridesmaid dress by JY Jenny Yoo (Style JY533). Bridesmaid dress by Sorella Vita (Style 8430). Bridesmaid dress by Bill Levkoff (Style 1274). Bridesmaid dress by Bill Levkoff (Style 1271). Bridesmaid dress by Amsale (Style Ruby). Bridesmaid dress by Sorella Vita (Style 8639). Bridesmaid dress by Bari Jay (Style 1723). Bridesmaid dress by Sorella Vita (Style 8736). Bridesmaid dress by Lela Rose (Style LR242). Bridesmaid dress by Sorella Vita (Style 8613). Bridesmaid dress by Sorella Vita (Style 8721). Bridesmaid dress by Studio Design Collection (Style 4515). Bridesmaid dress by BHLDN (Style Fleur). Bridesmaid dress by Hayley Paige Occasions (Style 5650). Bridesmaid dress by Bill Levkoff (Style 1255). Bridesmaid dress by Bari Jay (Style 1702). Bridesmaid dress by Social Bridesmaids (Style 8178). Bridesmaid dress by Allure Bridals (Style 1529T). Bridesmaid dress by Alfred Sung (Style D741). Bridesmaid dress by Bari Jay (Style 1707). Bridesmaid dress by Bill Levkoff (Style 1257). Bridesmaid dress by THEIA (Style 910149). Bridesmaid dress by Dessy Collection (Style 2997). Bridesmaid dress by Sorella Vita (Style 8826). Jumpsuit by THEIA (Style 910167). Jumpsuit by BHLDN (Style Jackie). Two-piece look by Bari Jay (Style 1713). Jumpsuit by Bari Jay (Style 1721).